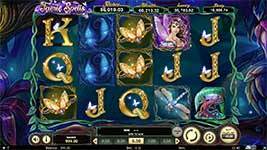 Review of: Faerie Spells Online Slot by Betsoft at Slotorama! Uncover the secrets of the undergrowth in Faerie Spells slot by Betsoft, a 3×5 video slot where woodland spirits brew potions in the shadows, and any toadstool could be hiding a hoard of treasure! Faeries and pixie princesses are joined by wild, green-bearded tree guardians, will o’ the wisps, and glowing, magical trees. The ruler of the realm, the Faerie Queen, can conjure two different features: her aura causes toadstools to reveal their riches, in the form of multiples of your bet; and three or more of her royal symbols triggers the unique jackpot game. The signature shared jackpot feature challenges you to collect special potion phials over the course of 10, 15, or 25 free spins. Every drop of potion collected contributes to one of four tiered jackpot recipes being concocted by the queen: the Spells of Plenty, Luxury, Wealth, and Riches. When a symbol is collected, it’s removed from the reels and other special symbols cascade down in a magical shower. With Betsoft’s innovative “Buy-In” feature, you can pay to trigger the max number of free spins on demand as many times as they like! Wild Symbol – The Wild symbol substitutes for all symbols in the game except Faerie Queen and Scatter symbols to complete wins when possible. Faerie Queen Free Spins – Land three or more Faerie Queens anywhere on the reels to trigger the free spins round. The Faerie Queen also releases the magic toadstool bonus prize. During Free Spins the game pays from left to right and features 1024 ways to win! Faerie Queen Jackpots – Capturing 3+ Faerie Queens on the reels transports you to the Magical Free Spins Realm. Collect Jackpot symbols to get closer to each of the 4 jackpots. Jackpot symbols explode and cascade wins are awarded. The four jackpots include the Riches Jackpot, Wealth Jackpot, Luxury Jackpot, and Plenty Jackpot. Scattered Faerie Treasures – Discover the secret faerie treasure scattered across the reels in the free spins realm to win. Scatter symbols explode, allowing more symbols to fall in place and more wins to be awarded. Magic Toadstool – Each Magic Toadstool has a cash prize attached. The Prize is only released if the Faerie Queen is present on the reels. Double Up Faerie Magic – Tap into the ancient spirit of the Fae! Using a little Faerie Magic, call upon nature to Double Part or All of what you already won after a spin. If the way of the Fae is with you, their magic will grant you the treasure that you seek.